First he studied singing under Unger in Vienna, then from 1909 to 1912 completed his education at the Academy of Music and Theater in Vienna. In the 1912-1913 season he was engaged as the first baritone by the Opera Theater in Moravian Ostrava. From 1913 to 1914 he appeared at the Aachen City Theater. His repertoire included part from operas of Wagner, Verdi and Mozart. He made guest appearances in Düsseldorf, Cologne, Hamburg, Lübeck, Graz, Prague and Breslav. In the 1914-1918 seasons he was a member of the Croatian National Theatre in Zagreb. Here he participated in opera premieres of G. Puccini’s ‘’La Fanciulla del West’’ and R. Strauss’s ‘’Salome’’. 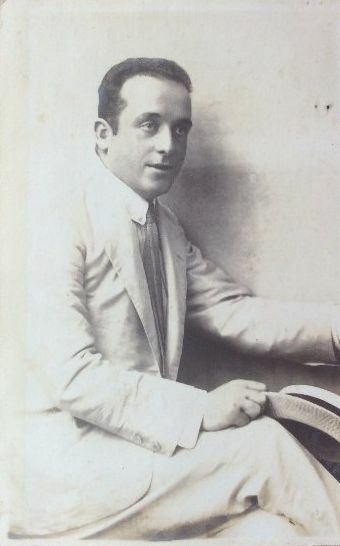 In 1918 he joined to the Slovenian National Opera and Ballet Theatre in Ljubljana and worked here up to 1924. His repertoire included Figaro, Rigoletto, Scarpia in ‘’Tosca’’, Tonia in ‘’Pagliacci’’, Athanaël in ‘’Thais’’ and many other parts. Since 1924 he started to appear as an actor and his star role was Jago in Shakespeare’s ‘’Otello’’.